Chautona Havig has been a favorite author of mine for a while now. She is one of those authors who takes great joy in offering her books as freebies as often as she can, which is how I first came across her books. From the first series of hers that I read, Aggie’s Inheritance, I was impressed by her willingness to not only avoid Christian stereotypes but to tackle them head-on. And as I read more and more of her books, I came to love how her characters are so widely varied in their beliefs and practices and how she often shows that the same actions can flow from a heart overwhelmed by grace and from one bound up in legalism. She has reminded me over and over in her books that it is not my part to judge people’s motives or spirituality but to love people for who they are – quirks, weaknesses, and all – and continually encourage those in my community to dig deeper in their walks with the Lord. Since finishing Aggie’s Inheritance, I have read pretty much every other book of hers that I could get my hands on. Some I love, some not as much, but I always find them spiritually growth-inducing. My personal favorites are Past Forward and its spin-off series Hearthland. In fact, I might actually be a little bit obsessed with Hearthland and wish I could live there. Maybe. As for the book – well, to be honest, I can’t decide whether I love it or not. It is definitely an incredible read on many levels, and I’m so glad I read it, and I even know that I’ll read it several more times. I highly recommend it as I believe that reading it will be a powerful and positive experience …. but I can’t promise that you’ll love it. It is written in first person, jumping back and forth from Carol to Michal. This adds a lot of depth to the story and lets you in on some of the raw emotions involved in culture shock, friendship, and personal growth. But it also made it a little harder for me to connect with some of the characters. I felt fairly sure I knew where the story was going, but the twists and turns made me doubt that a number of times and even doubt whether I wanted it to go there. I’m still not sure how I feel about the ending – things really could have gone a number of different ways, all leaving me with mixed feelings, I think. But, the ending aside, I loved the rest. I loved (and hated) learning more about Romanian orphans. I loved getting to know Michal’s friends and am hoping for some spin-off books about several of them. And, of course, I loved every single scene that happened in Hearthland and am looking forward to the next episode of Hearthland having a few scenes from this book from other perspectives. I don’t usually mess around with half stars – actually, I never have before – but for me this is a 4.5 star book. It’s far better than a 4 star book, but didn’t quite attain that 5-star “I-loved-loved-loved-this-book” feeling for me. One last thing – Chautona is offering a bonus to anyone who buys the book this weekend (November 26 – 30). If you email her your receipt, you will get a FREE short story containing letters from over the years between Michal and Carol. 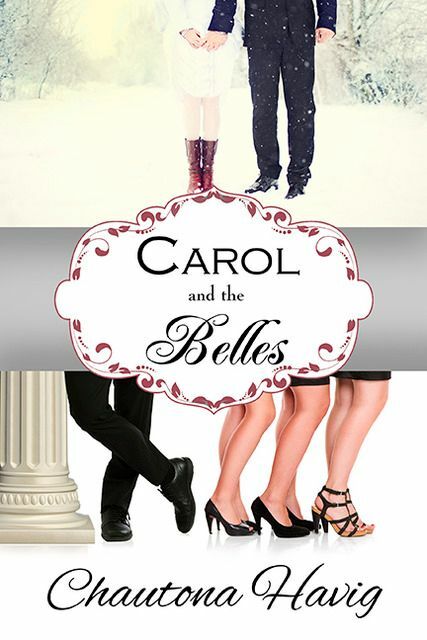 I hope you’ve enjoyed my review of Chautona Havig’s Carol and the Belles. To see my other Christmas reviews this year, please check out this post where you can also share what you are reading to get into the Christmas spirit this year! I hope to see you there! I think that the style the story was told in does push you to read a bit more carefully. I tend to be a fast reader and have to remind myself to slow down. Several times I re-read chapters because I missed subtle nuances that really revealed more of the characters. I agree, Sharon! I’m looking forward to re-reading it now that it’s done and published.